gEdit is a general purpose text editor that includes internationalized text, syntax highlighting, undo/redo, file reverting, print and print preview support and more. "using and knowing about gedit"
its was very easy to use. it was mainly supported for Linux, Ubuntu and windows . Mainly it was supported all programming languages like java ,C,C+,HTML etc for writing coding and configurable syntax highlighting.Its also supports configuration file for viewing and editing.And its very simple GU interface and simply access. mainly it was supported international-zed text .it having undo redo option are presented for get back or deleted text purpose.Its will supports colour fonts ,bracket matching and line numbers also presented for text/coding so we can easily identify the mistake/bugs in file. we can create empty files also using gedit . In gedit text editor there is no attractive/effective GUI and all option like same as regular editors. There is no auto saving options. and its look like old tool editor. I recommend this editor my colleagues and its is free of cost and is to use . Otro componente adecuado es de pequeña longitud: podría ejecutarse rápido tanto en PC de bajo cese como en dispositivo de computación de paro excesivo. Esto es bueno para los clientes que están más abiertos a operar con GUI, en lugar de organizar ensamblajes mecánicos de línea. Puede funcionar su código, o realmente cruzar como un corrector ortográfico. No puedo dar una explicación precisa de por qué, pero además no parece muy pulida, posiblemente debido a la fuente predeterminada o las alternativas de color heredadas. Descubrí que gedit es una forma demasiado simple y tengo opciones predeterminadas extrañas. También quiero que haya una mayor guía de git y problemas de sombreado para hacer que el código sea más legible y menos difícil de navegar y administrar versiones. Editor de texto integrado en los sistemas operativos Unix, para lo que es, un simple editor de textos. What Text Editor solution do you use? 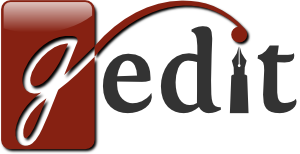 "Gedit: The best rich text editor"
Gedit has some features that make it great. It includes syntax highlighting that allows to markup the different parts of the code files, that it's very useful to develop. But it also include the posibility of work with multiples tabs for editing simultaneous files or for example you can undo and redo along all changes that you do, not just the most recent. In general it's a very good rich text editor. On the other hand, it is a very simple program, which does not have a lot of power to do certain tasks, such as working with third-party plugins, nor can you compare files side by side or compile from the same editor. Gedit is a great text editor that includes a lot of advanced features that make it a powerful text editor. It's available for free in all Linux distributions. In general I use Gedit because it is a graphic text editor that meets my requirements. I usually develop code from it, as well as edit configuration files or the system files. Gedit is a simple text editor that has gained popularity and now is the graphic text editor by default in many distributions. Before it was exclusive to Gnome, hence the name, g-edit. It is simple but fulfills its function, it allows you to open any type of plain text file without problems, it is fast and has useful functions to search within the text or replace words. As negative points, I find that it would be very useful to be in charge of making the indentation automatically according to the type of file, other similar applications do it without problems. Gedit es muy útil para editar en forma rápida cualquier tipo de archivo de texto. Es sencillo pero fácil de usar y efectivo. Viene por defecto en casi todas las distribuciones. Gedit is a tool that is used for everything in the day to day, since it is the default text viewer, so any file that I open is with Gedit. "One of the best development environments"
gEdit is a totally featured substance apparatus for Linux. Not at all like other substance altering instruments, for instance, nano and vim, gEdit gives you a magnificent and straightforward interface. This is ideal for customers who are more open to working with GUIs as opposed to arrange line mechanical assemblies. gEdit is adaptable, so it has features for the two originators and standard customers. It can highlight your code, or just go about as a spell-checker. gEdit mimics various uncommon features of more master content altering instruments, it doesn't have the ability to set edges and plan the configuration. So it may not be sensible for making articles and such. I prescribe gedit to anyone who does not have to use VIM or another further created content administrator, or for any person who needs to make a specific discharge. When I'm creating code, I can open various tabs and bob transversely over different archives. It includes my code and causes me be more beneficial. For instance, I can look at the standard work in a program and after that open the header archive in another tab and analyze the other limit executions meanwhile. There's basically no basic strategy for doing this with nano or vim. "Good IDE for make quick changes"
gEdit is a completely included content manager for Linux. Not at all like other content editing instruments, for example, nano and vim, gEdit gives you a delightful and easy to use interface. This is perfect for clients who are more open to working with GUIs instead of order line devices. gEdit is flexible, so it has highlights for the two engineers and standard clients. It can feature your code, or simply go about as a spell-checker. While gEdit emulates numerous extraordinary highlights of more expert word processing instruments, it does not have the capacity to set edges and arrange the design. So it may not be reasonable for composing expositions and such. In case you're a product designer hoping to make speedy change to the code and examine existing code, gEdit is for you. Anyway there are better instruments accessible on the off chance that you are creating starting with no outside help. When I'm composing code, I can open numerous tabs and hop crosswise over various documents. It features my code and encourages me be more profitable. For example, I can take a gander at the primary capacity in a program and after that open the header document in another tab and examine the other capacity executions in the meantime. There's simply no simple method for doing this with nano or vim. It is extremely simple to use for new client, Gedit is generalny preinstalled on any little person based work area so we dont need to do anyrhing to begin utilizing them. Other good thing is little size - it can run quick both on low end pc and top of the line work area. Proofreader has additionally punctuation featuring so can be easly used to programmig little applications. Module framework is extraordinary, client can expand capacity of editorial manager at whatever point he need. Its not useful for gigantic activities, its difficult to deal with a bunches of records and organizers. Out of box its not coordinated with Git framework promotion doesnt have record list toolbar. Opening colossal records can is incomprehensible on the grounds that proofreader is endeavoring to stack everyrhing into RAM(vim can stack it with no issues even on low spec pcs). Its additionally producing refuse records with tilde at the finishes, client need to add section to gitignore or cripple it in settings. "Good program to do simple tasks "
The best of Gedit is that it's always available and it's the default viewer in Linux systems. When you needs to modify some configuration files or read a log, Gedit it's a good option. It's very simple and easy to use and fore some tasks it's really efficient, for example to search patterns and replace words. It's a plain text editor that it's always available in your Linux to edit any text file. "Gedit: an advanced text editor with much features"
Gedit is the typical plain text editor of Linux like Notepad is in Windows. Gedit has some features that normally you don't expect in a plain text editor: It has an advanced search and word replace, document statistics, syntax highlighting, that enable programming like in a IDE compatible with almost all languages. Other thing that matters for me is that works with tabs, it's basic. As negative things, Gedit does not save a temporary file while you are writting, then if the computer stops sudentlly you lost all unsaved work. In a future versions, would be great an option to compile the codes from the same window of Gedit,. Gedit it's the best text editor for developers and normal users that needs a simple program to take notes. It works with all file formats, you can save in any format your files. Also it's available by default in all Linux systems. I use Gedit to develop C++ programs from Ubuntu computer. It's perfect for me because I can develop with the code formatted with the correct spaces and a color schema applied to the code, that helps me to find errors and read the code easily. "El mejor si buscas simpleza"
gEdit es un aparato de substancias totalmente equipado para Linux. No en absoluto como otros instrumentos de alteración de sustancias, por ejemplo, nano y VIM, gEdit le da una interfaz magnífica y directa. Esto es ideal para los clientes que están más abiertos a trabajar con las formas en lugar de organizar conjuntos mecánicos de línea. gEdit es adaptable, por lo que tiene características para los dos originadores y clientes estándar. Puede resaltar su código, o simplemente ir como un corrector ortográfico. Le prescribo gedit a cualquier persona que no tenga que usar Vim u otro administrador de contenido creado, o para cualquier persona que necesite hacer una descarga específica. Cuando estoy creando código, puedo abrir varias fichas y Bob transversalmente sobre diferentes archivos. Incluye mi código y me hace ser más beneficioso. Por ejemplo, puedo mirar el trabajo estándar en un programa y después de que abra el archivo de encabezado en otra pestaña y analizar las otras ejecuciones de límite mientras tanto. Básicamente no hay una estrategia básica para hacer esto con nano o VIM. gEdit is a completely included substance mechanical assembly for Linux. Not in the least like other substance modifying instruments, for example, nano and vim, gEdit gives you a superb and clear interface. This is perfect for clients who are more open to working with GUIs rather than mastermind line mechanical congregations. gEdit is versatile, so it has highlights for the two originators and standard clients. It can feature your code, or simply go about as a spell-checker. gEdit copies different phenomenal highlights of more ace substance adjusting instruments, it doesn't be able to set edges and plan the setup. So it may not be sensible for making articles and such. I endorse gedit to any individual who does not need to utilize VIM or another further made substance overseer, or for any individual who needs to make a particular release. When I'm making code, I can open different tabs and weave transversely over various chronicles. It incorporates my code and causes me be more useful. For example, I can take a gander at the standard work in a program and after that open the header chronicle in another tab and break down as far as possible executions in the interim. There's fundamentally no essential system for doing this with nano or vim. Es de los mejores y más faciles editores de texto de usar para LINUX. Este editor es el predeterminado cuando uso ubuntu, tiene numerosas características incorporadas como el resaltado de sintaxis para muchos idiomas. Muchas características se pueden modificar sobre la marcha, lo que puede ser útil para programadores que usan diferentes idiomas. Es gratuito, ya que está incorporado por defecto. Todas las características que gedit tiene actualmente son realmente buenas, pero aún se pueden agregar muchas características como compilador, diseños, etc. Gedit es demasiado simple en comparación a editores de texto avanzados o para programadores. Es bastante lento cuando carga archivos de texto grandes. Es un buen editor de texto que cumple con las funciones básicas que podemos realizar, puede quedarse corto para personas más avanzadas en el tema como programadores pero para usuarios normales es perfecto. Editor de texto básico, rápido y eficaz. Puedo escribir muchos tipos de códigos como HTML, PHP, C, etc. Es realmente un gran editor de texto simple. No hay necesidad de editores de texto más avanzados para principiantes.También sirve si estás empezando a programar. "Good editor for some tasks"
gEdit is a completely highlighted content tool for Linux. Dissimilar to other content editing instruments, for example, nano and vim, gEdit gives you a delightful and easy to understand interface. This is perfect for clients who are more open to working with GUIs rather than order line apparatuses. gEdit is flexible, so it has highlights for the two designers and standard clients. It can feature your code, or simply go about as a spell-checker. gEdit impersonates numerous extraordinary highlights of more expert content editing instruments, it does not have the capacity to set edges and design the format. So it may not be reasonable for composing articles and such. I recommend gedit to anybody who does not need to utilize VIM or another further developed content manager, or for any individual who needs to make a particular release. When I'm developing code, I can open numerous tabs and bounce crosswise over various documents. It features my code and causes me be more profitable. For example, I can take a gander at the principle work in a program and after that open the header document in another tab and examine the other capacity executions in the meantime. There's simply no simple method for doing this with nano or vim. gedit is a simple text editor, initially for gnome but later it was available in almost all distributions. It allows us to edit files graphically without too much pretense. I recommend gedit to anyone who does not have to use VIM or another more advanced text editor, or for anyone who has to make a specific edition. "Good text editor for quick modifications"
Gedit is the default text editor in most of the Linux distributions, as a consequence, it's free (opensource) lightweight and easy of usage. In gedit you have a desktop interface that it's very useful for some tasks in Linux, like search, and also Gedit is the best option when you works with Nautilus and you needs to open lots of files in one time. There aren't rich format options, that can be interesting for some tasks. Easy to use and useful to edit files. Edit files or write code. Also its useful when I use different tabs, because I can change with mouse. "A feature-rich text editing tool with a beautiful graphical user interface"
gEdit is a fully featured text editor for Linux. Unlike other text editing tools, such as nano and vim, gEdit provides you with a beautiful and user friendly interface. This is ideal for users who are more comfortable working with GUIs as opposed to command-line tools. gEdit is versatile, so it has features for both developers and standard users. It can highlight your code, or just act as a spell-checker. While gEdit mimics many great features of more professional text editing tools, it lacks the ability to set margins and configure the layout. So it may not be suitable for writing essays and such. If you're a software developer looking to make quick modification to the code and analyse existing code, gEdit is for you. However there are better tools available if you are developing from scratch. When I'm writing code, I can open multiple tabs and jump across different files. It highlights my code and helps me be more productive. For instance, I can look at the main function in a program and then open the header file in a new tab and inspect the other function implementations at the same time. There's just no easy way of doing this with nano or vim. That's a really user-friendly text editor with a clean and simple GUI, according to the philosophy of the GNOME project. It is installed by default in operative systems based on Linux and I recommend it for those who start programming in a Linux environment. The software simplicity can be also a disadvantage as their features are also quite limited. For instance, some important features, such as switching from header to source files, autocompleting words or searching files which are in the same folder. I usually use Gedit when I want to do small and rapid file modifications, but to be honest I prefer using other IDEs, such as VIM, which are more complete and provide a good experience between the terminal and the IDE. "gedit for making quick changes to scripts or looking at logs"
I like the fact that it is ubiquitous on most flavors of linux and the interface is familiar and easy to use. Search is reasonably fast and there are ways to integrate it into scripts and hack it. It struggles with larger files and it can be slow to respond to commands at times but that could just be the login server that I am using to launch it. It is a useful editing tool for basic viewing and editing. Nothing fancy about it in the sense that you can't use it for word processing and writing documents that need maintenance or version control. It allows me to view and edit files on the test machine without having to copy them over to my regular desktop station. It is much slower to have these files copied over the network especially when they are large files and all I need is to search for some keywords or make a quick edit and put the file back into production environment. It is really easy to use for new user, Gedit is generalny preinstalled on any gnome based desktop so we dont need to do anyrhing to start using them. Other good thing is small size - it can run fast both on low end pc and high end desktop. Editor has also syntax highlighting so can be easly used to programmig small applications. Plugin system is great, user can extend function of editor whenever he want. Its not good for huge projects, its hard to manage a lots of files and folders. Out of box its not integrated with Git system ad doesnt have file list toolbar. Opening huge files can is impossible because editor is trying to load everyrhing into RAM(vim can load it without any problems even on low spec pcs). Its also generating trash files with tilde at the ends, user have to add entry to gitignore or disable it in settings. Gedit it's a simple plain text editor and it's the default text editor in some environments like Ubuntu. There are some interesting functions available, setting the format when you programing, replace tools, language corrector, highlight the contents etc. Another interesting point is that there are tabs available and you can switch between. I use Gedit to open files when I'm working with the graphical environment. It's easy to use and the fastest option in some occasions. "Good complement to work in linux"
Like Notepad in Windows, Gedit is a simple text editor that allows you to modify files in graphical environment. In my case, I work most of the time with VIM but there are moments that you need to open some file from the file browser and the easier option is open and edit with gedit. It's really simple program, without any extra options, it just have the minimum to edit a file. Always is available in all linux distributions, thus it's interesting to edit files, if you don't have a VIM available or you don't know how to use it. Fairly simple and easy for a beginner to use. When I started coding in college, this was the first editor we were introduced to.Because it was so simple to use , we didnt even take one lecture to get adapted to it.But later on as my coding skills got better I preferred sublime text as I found it easier and more pleasing to look at. I wish there were more features and it was more aesthetically pleasing.I also genuinely wish there was more git support and colour themes to make the code more readable and easier to navigate and version control. Currently solving none, but sometimes I do use it is a text editor. It gets the basic job done. It is also a minimalisitic GUI. "Gedit: A Default Linux Text Editor"
- Free, Simple, Open Source notepad application and also a inbuilt text editor for Ubuntu Desktops. - User friendly interface and good graphical view. - Gedit is lighter (occupies very less Disk Space) and less feature rich. - It is Speed, Simple, Straightforward and ease of use. - Able to edit code and supports C, HTML, CSS, js, python, PASCAL and other scripts. - Special features such as syntax highlighting, drag and drop , search-and-replace tool, spell checker, code commenting add up to make gedit more easy for Users. - Support of Plugins by importing them we can auto-save, bookmarking the Files. - Beginners will gain a maximum advantage since no home work to be done before using this tool. - It is lightweight, neat, resource-friendly and capable of being a great solution to edit/write scripts. - Since it is an open source, the online support and gedit community support is very good. - Specific hardware requirements, system hangup, boot-up time variation, crashing of the editor has never occurred in my five years of Gedit Use. - Limited System Customization options. - Development on keyboard shortcuts should be improved. - Even with the availability of enhanced plugins, It is not much powerful and strong as Notepad++. If you are from a computer science background or a Linux kernel user, you will come across Gedit. It is famous for its simplicity and straight-forwardness. It might not as powerful as sublime and notepad++, but working on gedit is always a ten-on-ten experience. -Being a software engineer and open source contributor, I work mostly on Linux platforms. Gedit, because of its simplicity, I started using this as a default editor to save some random script of my project, to-do listing and many others. I will always keep open gedit ready before starting my industrial work. - Benefits: Free, Open source, Simple, less hard disk space, can save and edit any scripts, made ease for development of other software, beginners bitcoin. "Best editor for LInux platform"
It comes within the installation package of linux platforms like Ubuntu, Fedora etc, it has very simple interface and very easy to work. There are lot of unique features like text highlighting, indentation, auto completion and many more which makes it best for use of program editing, content writing. One more great feature of Gedit is customization. It is fair to use editor since it is free default editor one can use it. They should try to integrate compiler within Gedit, simple interface is needed but Gedit's interface is way too simple which bores you and doesn't motivate you to do your work. Lot more features can be added to it to make it better one. All LInux users will use Gedit atleast once , since it is default editor in the package, you use it for different purposes to get the better output of it. For simple text editing it is the best one, for Ubuntu and Fedora users it comes for greater use since it comes within the installation package and doesn't include any cost. Gedit is one of the best default text editor for Linux platform. It is simple text editor and there is no complexity in understanding interface. In Linux we find gedit as bext editor for writing programs. The features like auto suggestion, auto complete, indentation makes it great tool. We can customize and change preferences. I seems too much simple for advanced programmers. It lacks from many features, which other text editors have. Not a great interface, looks boring sometimes. It doesn't supports any plugins. Since gedit is already exist in Linux platform you can easily use it. It is really simple text editor to use. It best suits for simple code writing or text editing. If you want other features like some other text editors has, you can for that. I am a Linux user, So i use gedit for one or other purposes. It is a great text editor for beginners. I use gedit for writing different types of programs like C, Web languages etc. "Text editing at its best usage"
This is default text editor which has many inbuilt features in it, like syntax highlighting for many popular languages. Many preferences and many features can be modified on the go which is helpful for many programmers of different languages. It is free as it s inbuilt which is more handy when it comes to editing with all normal features included. Doesnot display where the file is located and folder view like how sublime shows in left bar in a tree structure. User interface is bit boring all the time and not cool text fonts. Rest everything is best in editing with gedit with fast accessing and no crashing since iam using. As a beginner in programer in any language he can choose this editor as best as he can avoid many beginnign mistakes which helps him progress his coding skills in less time. A compter programmer intrested in coding and competetaions for which i started my coding with gedit which helped me lot to undersatnd the code and made me avoid many mistakes by its proper indentation and syntax highlighting. "Great default edit for Ubuntu"
It is a great default text editor for Linux. It is a simple free software. It comes with many features like auto suggestions, preference changes etc. It can be used for many purposes like programming, content writing. It also supports indentation and it is easy to use. All the features gedit currently have are really good, but still many features like compiler, designs etc. can be added. Gedit is too simple for advanced text editors or programmers. It is the default text editor for Linux users. It is really simple and easy to use. For beginners, it is really great tool. Since I am using Linux OS, gedit is my text editor for writing many types of codes like HTML, PHP, C code etc. It is really great simple text editor. No need of alternative text editors for beginners. "The best ubuntu text editor." As described in the title, it is the default text editor used in ubuntu. For me, it is one of the very best, as it is flexible with many features and highly customizable. It doesn't support any plugin platforms, to make it more customizable, such as adding terminals and integrated compilers. It is still quite slow when loading large text files. I strongly recommend other people using ubuntu or other linux distros regularly Gedit as being the best text editor available. If you use it for editing code enable line numbering and install solarized dark theme. I have been using it as a user for reading text files, editing codes. I used it in my first academic year for editing and compiling code in Haskell functional programming language. I also liked the solarized theme that was available for gedit. Best text editor for any user more helpful for beginner. No need to install it seprately as it comes inbuilt with ubuntu operating system. Many syntax higlighting, indentation formatting etc...are good to use which is free of cost. Cool user interface is an advantage. Not available for windows operating system. UI doesnt change which is same from when i installed my OS. No other comments on gedit as it is the best editor for anyone. All ubuntu users have a chance of getting the best editor for free with many features included and easy to use and handy tool. A passioned programmer with best addicted to C programming i use gedit for code checking and verifying which neatly displays my code in proper indentation and highlighting which makes me understandable. "So much easier than vi." It's an easy to use editor that doesn't rely of tons of horrible key combos. Multi-document interface works well. As a basic text editor it makes life a lot easier, it's still very basic though. If your new to Linux based operating systems then gedit is the way to go, it's much easier to use than vi and you won't tie yourself in knots trying to do the most simplest of things. Making quick edits to documents are easy with gedit, however I prefer to use a programmers editor for editing source code. There are a few positive things I can say about gedit. It's available as part of GNOME and set as the default text editor, so chances are you will run into using it as some point or another. It is also simple and fairly easy to use. gedit also supports syntax highlighting and customizable indentation. I found gedit to be far too simple and have strange default options. I can't exactly explain why, but it also doesn't look very polished, possibly due to the default font/background color options. I do not know many people who prefer to use gedit. There are many options for text editors that are better than gedit. For raw performance, consider using Vim or Emacs. For a more rich experience, consider Sublime Text or Atom. gedit is kind of stuck in the middle, and while it makes sense for a default GNOME application, it probably isn't what you really want to use as your main text editor. I use gedit when my other preferred text editors are not available. It serves its purpose fairly well if all you want to do is simple text editing. "Easy-to-use text editor without frills"
Gedit is a lightweight text editor that fits most of my needs. It is fast to load and never crashes. Open source and free. If you would like to write formatted code without installing tons of programs, this is a good, free option. There are probably better options for serious text editing. Writing formatted code on personal computers, computers without dedicated software development packages, etc. "Easy to use for those familiar with operating system shortcuts"
The lack of customization. Its so simple that it is restrictive to power users. It is really simple and always available and installed. If you are using Ubuntu this program is that reliable friend that is always supporting you although you know he is a bit limited he always has good intentions. Too simple to handle real work problems, it doesn't work fine with large files. If you do not have any other option or you don't have time to install other options it's a good choice. We code simple programs with gedit or we use it for fast fixes. Not much functionality. Navigation is hard when working on a project. "Best text editor for Linux"
It is a very good text editor. When writing a source code, it colours and highlights your text according to the language you code in. Unlike other UNIX text editors(emacs), it does not contain a "console" for compiling and running the code right there. "Gedit is simple and gets the job done"
* We monitor all gedit reviews to prevent fraudulent reviews and keep review quality high. We do not post reviews by company employees or direct competitors. Validated reviews require the user to submit a screenshot of the product containing their user ID, in order to verify a user is an actual user of the product. Hi there! Are you looking to implement a solution like gEdit?